murals, painting on chocolate, puppets, sculpture, clay and polymer clay. All art students are encouraged to work in their preferred choice of medium, subject matter, style of art and at their own speed. Art Classes are available and on going through Summer, Fall, Winter and Spring. Serving art students in Palm City, Hobe Sound, Jensen Beach, Sewall's Point, Hutchinson Island, Port Salerno and all of Martin County. The students preferred subjects vary from tropical paintings, portraits, landscapes, seascapes, seascapes, animal portraits, murals, community projects. For more information about her Commissions click here. For examples of her Portrait Paintings click here. For examples of her Botanical Paintings click here. For examples of her Landscapes click here. For examples of her Seascapes click here. For examples of her Plein Air Landscape and Seascape Paintings click here. 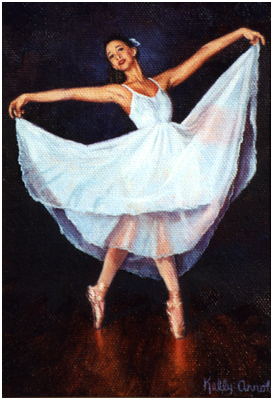 For examples of her Ballerinas click here. For examples of her Fruit Paintings click here. For examples of her Animal Portraits click here. For examples of her Paintings of Buildings click here. For examples of her Plein Air Buildings click here. For examples of her Painting on Chocolate click here. For examples of her Puppet Sculptures click here. For examples of her Murals click here. For more information about her Adult Classes click here. For more information about her Children's Classes click here. For more information about her Student's Artwork click here. For more information about Kelly's art related events click here. To join Kelly's email list click here. To contact Kelly click here. Kelly created a Free art club in May 2013 called The Arts Enrichment Club. You are welcome to join. To sign up and find out more click here. All artwork shown are original works of Kelly Arnold and her students protected by copyright.